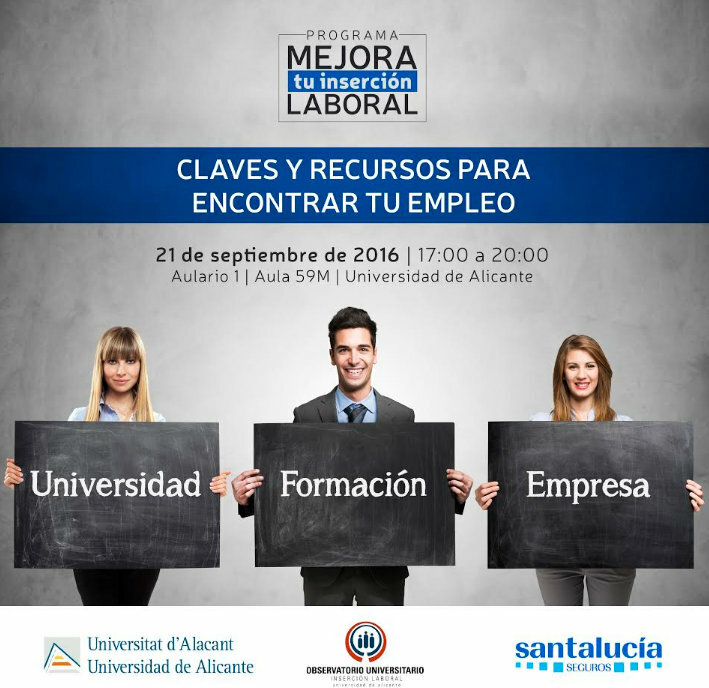 The next 21 September 2016, of 17:00 to 20:00 in the Aulario 1 - Classroom 59M, will llevar a new session of the Program of Improvement of Insertion Laboral of the University of Alicante, developed with the collaboration of Santalucía Safe. During this new session will centre us in contributing "Keys and resources to find your employment" and will work on the strategies that use the companies to attract and cultivate the loyalty the best talent inside his organisations. The session will be developed by Carmen García Alvarez, professional with more than 16 years of experience in direction, gestión and implantation of projects and political of RRHH. Solid knowledges and experience in gestión of the talent, development and selection. Design, implantation and follow-up of models of identification, evaluation, development, leadership and processes of RRHH for different companies and sectors. At present it occupies the position of Director of RRHH in Accepta Integral Services of the Group Santalucía.